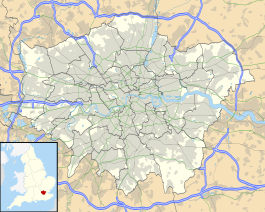 Rayners Lane is a London Underground station in the district of Rayners Lane in north west London, amid a 1930s development originally named Harrow Garden Village. The station is on the Uxbridge branch of both the Metropolitan line, between Eastcote and West Harrow stations, and the Piccadilly line, between Eastcote and South Harrow stations. The station is located to the west of the junction of Rayners Lane, Alexandra Avenue and Imperial Drive (A4090). It is in Travelcard Zone 5. Just east of the station, the Piccadilly and Metropolitan lines tracks join for services to Uxbridge and separate for those to Central London. The Metropolitan Railway (Harrow and Uxbridge Railway) constructed the line between Harrow on the Hill and Uxbridge and commenced services on 4 July 1904 with, initially, Ruislip being the only intermediate stop. At first, services were operated by steam trains, but track electrification was completed in the subsequent months and electric trains began operating on 1 January 1905. Progressive development in the north Middlesex area over the next two decades led to the gradual opening of additional stations along the Uxbridge branch to encourage the growth of new residential areas. Rayners Lane opened as Rayners Lane Halt on 26 May 1906, and was named after a local farmer called Daniel Rayner. 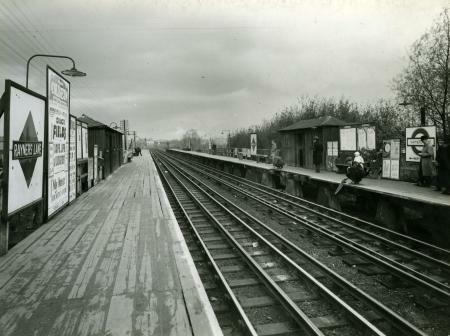 On 1 March 1910, an extension of the District line was opened from South Harrow to connect with the Metropolitan Railway at Rayners Lane junction east of the station enabling District line trains to serve stations between Rayners Lane and Uxbridge from that date. On 23 October 1933, District line services were replaced by Piccadilly line trains. 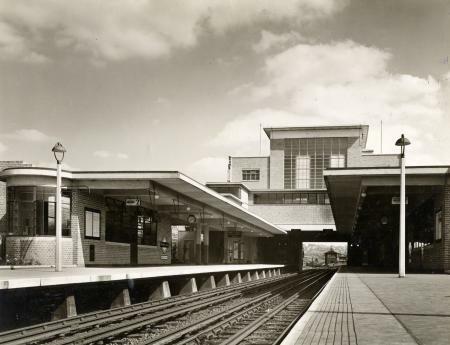 The station was rebuilt in the early 1930s to a design by Charles Holden and Reginald Uren which features the large cube-shaped brick and glass ticket hall capped with a flat reinforced concrete roof and geometrical forms typical of the new stations built in this period. To the west of the station, there is a reversing siding between the running tracks and, during the day, half of the Piccadilly line service reverses here. Two sidings were located south of the station but these were no longer used: with no connection with the running lines. In late 2017 these sidings were lifted. The Metropolitan Line is the only line to operate an express service, though currently for Metropolitan Line trains on the Uxbridge branch this is eastbound only in the morning peaks (06:30 to 09:30) Monday to Friday. Metropolitan Line trains are able to terminate at Rayners Lane from the westbound platform either by a crossover to the east of the station or via a center reversing siding to the west, under normal circumstances all westbound Metropolitan Line trains continue to the terminus of the branch at Uxbridge. Piccadilly line trains are also able to terminate here by means of a crossover to the east of the station (separate from the Metropolitan Line crossover) and via the center reversing siding although only the latter is used in normal service. Between Rayners Lane and Uxbridge there is no Piccadilly Line service before approximately 06:30 (Monday - Friday) and 08:45 (Saturday - Sunday), except for one early morning departure from Uxbridge at 05:18 (Monday - Saturday) and 06:46 (Sunday). London Buses routes 398, H9, H10 and H12 serve the station. ^ Hardy, Brian, ed. (March 2011). "How it used to be – freight on The Underground 50 years ago". Underground News. London Underground Railway Society (591): 175–183. ISSN 0306-8617. ^ Historic England. "Rayners Lane Underground Station (1261430)". National Heritage List for England. Retrieved 26 January 2014. ^ Harris, Cyril M. (2001) . What's in a Name? (4th ed.). Harrow Weald: Capital Transport. p. 58. ISBN 1-85414-241-0. ^ a b c d "CULG - Metropolitan Line". www.davros.org. "Rayners Lane station". Tube live departure boards. Transport for London. "Rayners Lane". Photographic Archive. London Transport Museum. Archived from the original on 26 January 2014. Platforms at Rayners Lane station, 1934 One platform shows a London Underground style roundel name board, the other a Metropolitan Railway Diamond name board. 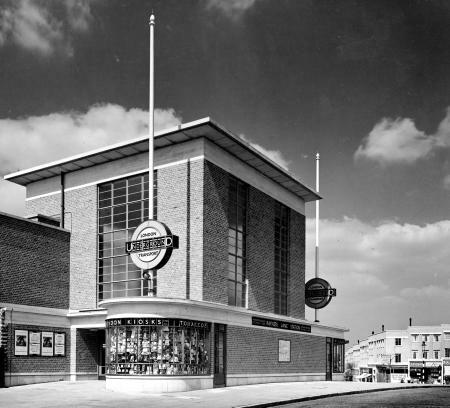 Wikimedia Commons has media related to Rayners Lane tube station. This page was last edited on 15 February 2019, at 08:42 (UTC).